The U.S. market for nutraceuticals is competitive in nature and is likely to witness a significant rise in the level of competition throughout the forecast period, states a new market intelligence study by Transparency Market Research. The rising number of collaborations and mergers and acquisitions is projected to enhance the competitive environment of the overall market in the next few years. In addition to this, the expansion of the product portfolio is one of the major factors that is projected to accelerate the growth of the growth of the U.S. market for nutraceuticals. The launch of new products and the research and development activities taking place are some of the other key factors that are predicted to enhance the growth of the nutraceuticals market in the U.S. in the next few years. Some of the key players operating in the nutraceuticals market in the U.S. are The Nature’s Bounty Co., Pepsi Co., Bayer AG, Royal DSM NV, Abbott Laboratories, Chobani LLC, Herbalife International Inc., Amway Enterprises, General Mills Inc., and Groupe Danone. According to the market research study by Transparency Market Research, in 2015, the U.S. market for nutraceuticals was worth US$64.8 bn. The market is further projected to reach a value of US$102.6 bn by the end of 2024 and register a healthy 5.30% CAGR between 2016 and 2024. 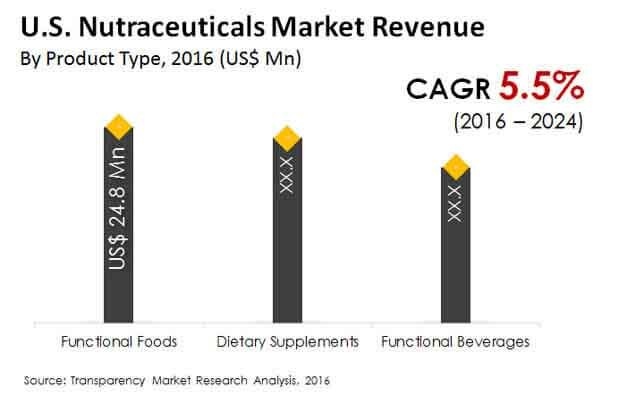 The U.S. market for nutraceuticals has been classified on the basis of product type into functional beverages, functional foods, and dietary supplements. Among these, the functional foods segments is anticipated to lead the overall market in the next few years with a large share of the market. The rising demand for functional foods, owing to the rising awareness among consumers regarding the benefits of consuming functional foods is one of the key factors estimated to encourage the growth of this segment in the next few years. In addition to this, the rising preference of consumers for a healthy lifestyle is projected to enhance the growth of this segment in the next few years. As per the research study, this segment is projected to register a 6.10% CAGR between 2016 and 2024. The U.S. market for nutraceuticals has been segmented on the basis of product form into powder, solids/semi-solids, liquid, and tablets and capsules. Among these, the liquid nutraceuticals segment is projected to witness a strong growth in the next few years. As per the research study, this segment is likely to account for a large share of the overall market, thanks to the rising adoption among consumers throughout the forecast period. Furthermore, the other product forms of nutraceuticals including powders, tablets and capsules, and solids/semi-solids are expected to observe a healthy growth, owing to their increasing demand in the next few years. In addition to this, the increasing consumption of nutraceuticals and the increasing level of awareness among consumers are some of the other key factors that are estimated to enhance the growth of these products forms in the coming few years. The increasing consumption of major products, such as fortified wheat, iodized salt, and supplements and the maturity of markets are some of the major factors that are estimated to accelerate the growth of the U.S. nutraceuticals market in the coming years. The increasing preference for on-the-go food products is predicted to accelerate the growth of the market throughout the forecast period. On the other hand, the negative publicity of these products along with the false health claims are predicted to restrict the growth of the U.S. nutraceuticals market in the next few years. The rising demand for supplements and functional foods is expected to encourage the growth of the U.S. nutraceuticals market in the next few years. Rising number of players to encourage market growth and enhance the competitive environment of the U.S. nutraceuticals market in the near future.